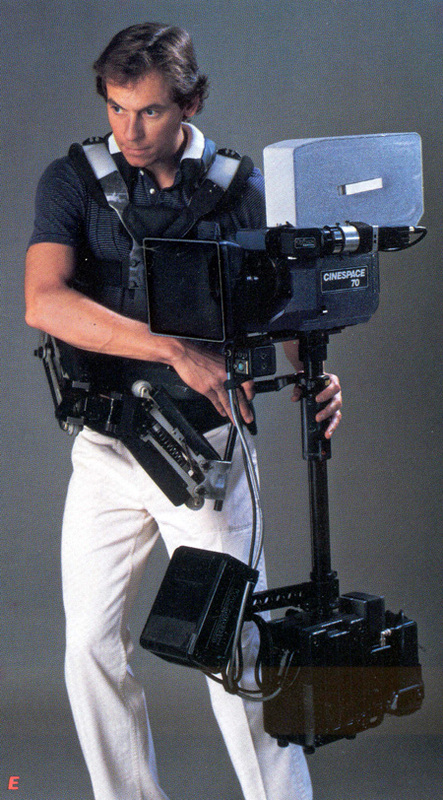 Garrett Brown's OSCAR winning Steadicam rig equipped with a Cinespace 70 Todd-AO 65mm camera, late 1980s. ...I unhappily admitted to my wife that unless the viewfinding problem was solved, my would-be stabilizer was unlikely to generate any income. A week later, in search of Christmas presents for my son Jonathan at the Edmund Scientific Company just over the bridge in Barrington, New Jersey, a startling answer appeared. In addition to serious optical equipment for professionals, Edmund offered an array of science toys and a brand-new wonder: a cheap, fiber-optic viewer. For $29.50 I bought myself a two-foot demonstration ‘Fiberscope’. It had 13,000 plastic fibers bound into a flexible tube and organized so that each one carried its single pixel from one end to the other! Back at the farm, I walked around holding the viewing end to my eye. It was grainy, but as the lens floated over objects and through space, I became excited imagining this full-color remote image coming from my film camera out on the pole! The manufacturer of the little fiberscope was named on the box: The American Optical Corporation of Southbridge, Massachusetts. A long earnest phone call got the attention, successively, of receptionists, secretaries, executives, and finally of Walter Siegmund, himself, one of American Optical’s chief scientists. I described my plan to provide hundreds of ‘stabilizers’ to the movie industry, fitted with hundreds of his fiber-optic viewers! He carefully listened to my story, suggested, to my relief, that I not tell him the details of the invention, and invited me to visit the factory. We made an appointment for the following week. Sandie and I stashed Jonathan with her mother and drove to Massachusetts. Dr. Siegmund was a tall, gray-bearded, Nordic-looking fellow with a gentle professorial manner. He was completely film-savvy, in fact had developed Todd-AO, the grand wide-screen system for Mike Todd’s "Around the World in 80 Days" (I had never known that the AO stood for American Optical! ), and as he gravely watched the little image on my Akai video recorder, he nodded and smiled and said, “That’s good. That’s really good!” Dr. Siegmund looked at Sandie and me for a moment, and at the little plastic fiberscope I had brought along. “We can do better than that.” He opened a drawer and handed us what looked like a five-foot garter snake. It was a much longer, much more impressive bundle than I had dared to hope for. It had an 8mm image area and was as limber as a bull whip with a lens on one end and a cupped viewfinder at the other. He told me it had 87,000 optical glass fibers, each little thicker than a human hair, each with a core of incredibly transparent glass—light would pass through miles of the stuff!—and each with an outer coating of a different glass which formed a mirror-like boundary. An entering photon of light made a few shallow bounces along the whole length of a fiber’s core, like a stone skipping across water, and emerged intact! Dear Thomas, Please give my very best regards to Walter Siegmund. I have been in touch with him since you sent me his contact info. Here attached is an excerpt from my unfinished book on the invention of the Steadicam. It documents my first meeting with Walter and you have permission to publish it with, of course, the usual attribution and copyright notices. I am still generally overbooked and unable to either finish my book or write your article, but I'm hopeful things will settle down soon. It's all worthwhile stuff, but I'm beginning to yearn to retire. I have stopped shooting movies as of this year, so that's a start. 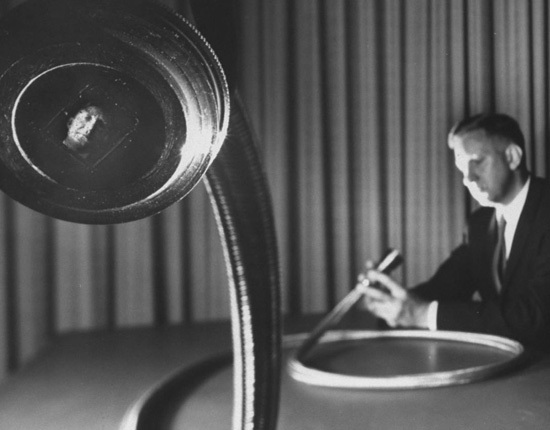 Walter Siegmund looking into a fiber optics cable. Note his face to the left. “Of course,” he said, “This small bundle costs $2,000. You could optically reduce your 16mm image to fit, or you could buy a larger version with the same picture area as the film—that would be sensational.” He paused for a second. “Wait here.” He left the room. Sandie gave me an alarmed look. In five minutes he was back with an even bigger, thicker, and more limber snake—six feet long and sheathed in sinuous overlapping aluminum scales. Dr. Siegmund explained that this one had 360,000 fibers and the image area was exactly 16mm wide!. He told us that if the polished end of the bundle could be inserted to exactly replace the ground glass in my 16mm camera, the result would be sensational! (In a ‘mirror-reflex’ movie camera, the image from the lens alternately falls directly onto the film or bounces off a rotating mirror onto a film-sized ground glass screen, which is viewed by the eyepiece). “With this one,” Siegmund said, “you’ll see a luminous ‘f-1’ image from six feet away! It will be brightest viewfinder you’ll ever see! He encouraged us to walk around and compare it to the smaller snake, and we both involuntarily exclaimed at the resolution of the big bundle. Siegmund cautioned me that this object was worth $8,000. and if it were ever sat upon or bent too tightly, it would go entirely, un-repairably, black, black, black! The scattered, visible flaws were from stray fibers that had broken here and there, like dirt on an old screen door. I strolled around his office, cruising American Optical’s impressive collection of awards, past my shocked young wife’s face and Dr. Siegmund’s benevolent visage; but my joy over this miracle was dashed by its utter unaffordability. The key to making my ‘invention’ functional in the world of film, lay coiled in my hand, yet was impossibly out of reach. I asked if we might get any kind of special deal, considering the vast potential for sales generated by my invention, and Siegmund said that he would think it over. Meanwhile he would rent me the ‘small’ 8mm bundle to experiment with for $100.00 per week. Although 'hundreds of fiber-optic viewfinders' did not end up on Steadicams (we went with video as soon as it became practical), Walter Siegmunds 'big bundle' did allow Garrett Brown to make his now-legendary demonstration film that included thirty 'impossible' shots--including a run down and back up the soon-to-be-famous Philadelphia Art Museum steps!